CAPTION: Out of the estimated 30 people in attendance at the GRTS building trades house auction last night, three placed bids. 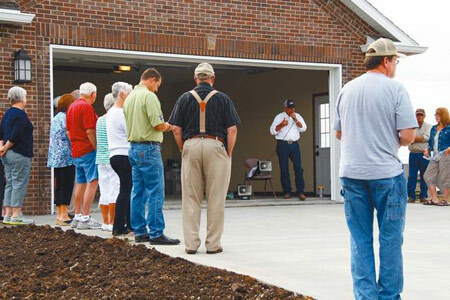 The auction was held outside the building trades home located at 2050 Lakeview Drive in the Lakeview estates. The home sold for $200,000 to Anthony and Brandi Ewing. About 30 people were in attendance at the Grand River Technical School building trades house auction, and three people placed bids on the home. This year's building trades home is located at 2050 Lakeview Drive in the Lakeview estates and is a ranch style home with a brick front and an estimated 1,950 square feet. The house has three bedrooms, two bathrooms, and an unfinished basement. Mike Miller was the auctioneer. The opening bid was $150,000. When bidding came to a standstill at $190,000, Miller announced that the auction would be paused momentarily as he discussed with Chillicothe R-II Superintendent, Dr. Roger Barnes; GRTS assistant director, Adam Wolf; and GRTS director, Jayme Caughron on whether or not they would let the house go for $190,000. It was decided that $190,000 was too low. Then, another break was taken when bidding reached $195,000. GRTS building trades instructor, Don Dennis joined the conversation this time to discuss the $195,000 bid. While they were discussing, Billy Keith put in a bid of $200,000 for his daughter and son-in-law, Brandi and Anthony Ewing, who are currently on vacation and were unable to attend the auction. After announcing the $200,000 bid, Miller opened bidding up again and asked if anyone would bid $201,000. When no one else would bid, Miller announced that the 2014-2015 GRTS building trades house was sold to Brandi and Anthony Ewing for $200,000. Wolf said the past five houses the building trades class built were custom built homes for individuals. For this year's house, it was decided to go back to building a spec house and auctioning the house off at the end of the school year as they had done for numerous years before building custom homes. Wolf said he thought the auction was a success. >> See complete auction details here. Walk-through 3 until 7 p.m. on Wednesday, March 4. "Whatever good things we build end up building us," - Jim Rohn (1930-2009), entrepreneur, author and motivational speaker. Logan Lyons graduated from Chillicothe High School in 2013 and returned to school this past fall, enrolling in Grand River Technical School's building trades program. He is developing carpentry skills and plans to pursue carpentry as an occupation. His father and grandfather are self-employed carpenters, and the skill is something that interests Lyons. After completing the program at GRTS, he plans to enter a carpenter's apprenticeship program in Kansas City. Not only is Lyons learning carpentry through GRTS alongside 30 fellow building trades students, he is learning other skills needed to build a house. When he enrolled in the program, Lyons knew that the class project was to build a house; but, he was pleasantly surprised to discover that he would be learning how to do most all aspects of building a house, including building cabinets. "Nowadays, you need a degree or certificate," Lyons said, as he considers his future. "This is one of the best places to start. It is well worth the money." Although Lyons entered the program with some background knowledge because his father and grandfather are carpenters, many students enter the program without prior knowledge. They enroll because building trades is a field of interest to them. "With some students, we have to start from scratch," said Don Dennis, who became a GRTS building trades instructor in 1996. But, throughout the year, all students learn a broad spectrum of skills and have something tangible to show for their work. "It is gratifying to see a project get finished," Dennis said. "Most parents are pretty amazed when they come to one of our open houses and see what the students have done." The building trades class has been a strong program for GRTS and has built a house each year since the school began in 1967. This year, there are 31 students building a house at 2050 Lakeview Drive. There are 15 students in the morning class. Two students are from Linn County, three from Southwest R-1, two from Grundy County, one from Braymer, two from Tina-Avalon, four from Meadville, and one from Hale, along with four post-high adult students working the full day. There are 12 students in the afternoon class, with two students from Hamilton, four from Trenton, three from Cameron and three from Chillicothe. The class now is in the process of finishing drywall at the house and building oak cabinets in the shop at school. Chris Todd is in his 10th year teaching the building trades class. He is a 1980 graduate of Tina-Avalon School and went through GRTS's building trades program as a senior in high school. After graduation, he put his skills to work through a number of trades, and worked as a plumber, an electrician and a carpenter before running his own construction company, Todd Construction, for eight years. This year's project is a single-story, three bedroom home with a full basement and two-car garage. 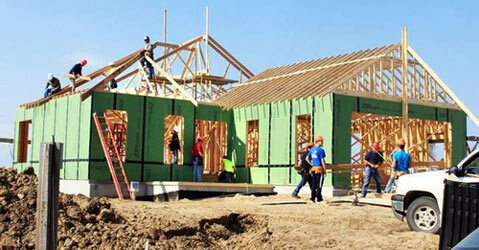 Students do most of the work that is necessary to build the house. They pour the flat concrete, rough in the house, hang the siding, do the roofing, trim work, sheetrock, flooring (tile and hardwood), wiring, plumbing and, if time allows, landscaping. "They get basic knowledge of every aspect of a house going up," Todd said. Outside contractors lay carpet and install the HVAC. There are many professions that can stem from building trades. Students who complete the course could pursue careers as plumbers, cabinet builders, roofers, electricians, or in fields of carpentry (rough-in crew, or a finish carpenter), siding, concrete, landscaping or, even, architecture. "There are a lot of directions you can go," Todd said. While some students may not pursue construction as their primary profession, they at least develop a skills set that could benefit them in the future. The skills learned could complement their career choices or be beneficial in their own homes. When students are high school sophomores, they visit GRTS and learn about the programs that are offered through the school. "They see what we do hands-on," Todd said. "That sparks their interest when they see what we actual do. Maybe, it gets them interested in something they haven't even thought about before." The houses that are built by the building trades students have been sold different ways throughout the years. Some were built by taking sealed bids and having the house built for a specific person; while others have been built for a developer; or built and then auctioned. By choosing the auction-type format, the building trades instructors can select the type of project that best fits the program's needs and teach the students in the best manner possible, Todd said. This year's house is a modern house that will fit into the neighborhood, he said, and will be auctioned in late May or early June. The school will host a walk-through for the public to view the progress made on the house from 3 until 7 p.m. on Wednesday, March 4. Once the house is completed, it will be on display during an open house closer to the date of the auction. CAPTION: Students of Grand River Technical School's building trades class are putting rafters on the roof of a new home they are building in on Lakeview Drive in Lakeview Estates. The students began work in early September and plan to be finished by late May or early June 2015. Students enrolled in Grand River Technical School's building trades class are well on their way to constructing this year's house in north Chillicothe. The house is located on Lakeview Drive in Lakeview Estates and the plan, at this time, is to auction the house after it is completed sometime around late May or early June 2015. The foundation was put in by a subcontractor this summer and soon thereafter, students began pouring the basement and doing the plumbing work beneath the basement floor. Students also did the rough-in of building the walls. They now are in the process of putting rafters on for the roof. There are 37 students enrolled in the building trades class. Work is done on the house during a morning session and an afternoon session. The goal is to have the house fully enclosed within the next couple of weeks and before cold weather hits, according to Don Dennis, GRTS building trades instructor. Through the class, students learn basic carpentry skills, cutting compound miters, driving nails, measuring, and much more. In the process of building a house, they use the skills they have learned. Grand River Technical School's building trades class began building homes in 1967 and, traditionally, have built one home per year since. This year's house will have 1,900 square-feet on the main floor with three bedrooms and two bathrooms, plus a garage that measures 27 feet by 24 feet. Upon completion, an open house will be planned for the public to view the product of the students' labor. "The open house is a good opportunity to show of their work," Dennis said. The house is also a permanent testimony of work they have done. "I tell the students that 50 years from now, you can drive down the street and see a house that you helped put up," Dennis said. "That's a good feeling."